Bluetooth Low Energy (BLE) is the de facto wireless protocol choice by many wearables developers, and much of the emerging internet of things (IoT) market. Thanks to it's near ubiquity in modern smartphones, tablets, and computers, BLE represents a large and frequently insecure attack surface. This surface can now be mapped with the use of Blue Hydra. Built on the bluez library, Blue Hydra employs built-in BLE hardware, which can be further enabled by the use of Ubertooth hardware, to discover and track not only low energy, but classic Bluetooth devices too. You can learn more about how Blue Hydra works by watching the Defcon 24 talk. In this tutorial, we will download Blue Hydra on a Raspberry Pi running Raspbian, and get started tracking. Those of you already familiar with using Aircrack -ng will be right at home with Blue Hydra, as they are very similar. If you want to get more familiar with Bluetooth security, Null Byte has you covered! You can get up to speed with Terms, Technologies, & Security, learn to Control Any Mobile Device, and get your Reconnaissance on. Ubertooth hardware (optional to detect Classic devices not in discoverable mode) Not a replacement for a conventional Bluetooth dongle! First, we'll prepare the OS we'll be runnig Blue Hydra on. For this tutorial, we'll be using Raspbian. You can download the Raspbian image directly, or torrent via your favorite Torrent client on the Raspbian download site. Once the download is complete, we need to write the image to our microSD card. It's a good idea to unplug any external hard drives or other USB devices you have, and then insert your microSD into its adapter and plug it in. This is important since you don't want to accidentally flash the wrong device. If you already have a program for flashing live images to the card, then you can use that. 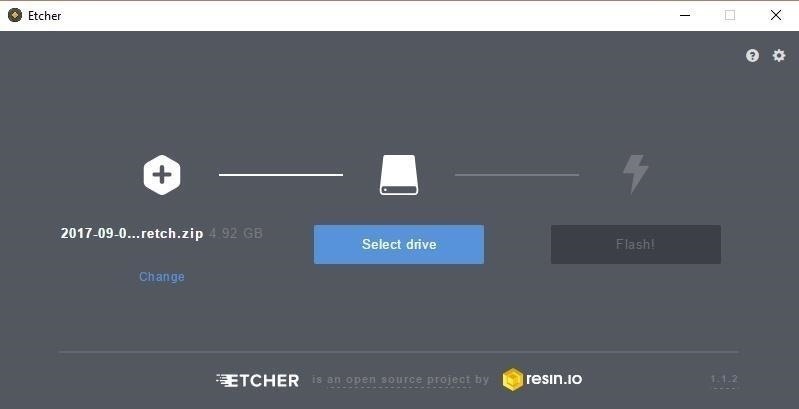 Otherwise, download and install Etcher, as it's the easiest to use for making bootable SD cards. It works on Windows, Mac, and Linux, while also having a simple to use interface. Go ahead and open Etcher when it finishes installing. Insert the SD card into the slot at the bottom of your Raspberry Pi and plug the Pi into an HDMI cable leading to a display and a power cable. If you want to SSH into your Pi, make sure to plug the Pi into Ethernet, with the other end of the Ethernet cable going into your router (which is wired or wirelessly connected to your computer). Remember the username is pi and the password is raspberry. After you connect, make sure to change the password with passwd, and then update your Pi with the following commands. If you aren't planning on using Ubertooth hardware, you should still follow these steps or Blue Hydra may not run correctly. If you are using an Ubertooth, make sure to plug it in before we start, as it may need a firmware update. Unfortunately, Ubertooth is not in the Raspbian repository, so we have to download it manually. First, we need to install the dependencies for Ubertooth before we can build libbtbb and Ubertooth. This can take some time, but usually not much longer than 5 minutes. Now, we are ready to set up the Bluetooth baseband library, libbtbb. This lets the Ubertooth decode Bluetooth packets. Download the file from Github with the command below. Now, unzip it, navigate to the directory, and create a build directory by typing the following. We are now ready to use cmake to install it. Wonderful! Now that we have libbtbb installed, we are ready to install Ubertooth itself. Move to your home directory by typing cd and then are ready to do the same process as before to install Ubertooth file. Download it from Github. Then use the same process as before to install. Lastly, move back home with cd, and if you actually have an Ubertooth device, make sure it is configured correctly with sudo ldconfig and ubertooth-util -v which should be "Firmware version: 2017-03-R2 (API:1.02)"
Now we are ready to install Blue Hydra's dependencies. Now we are ready to install the long list of other dependencies required. Before running the last command you should know that if you run it as root it could cause problems for other users that try to use Blue Hydra. If you only use root then you're fine, otherwise, you can use the sudo command as needed. You may want to write down some quick notes about the controls before you press enter or you can just reference this screenshot. 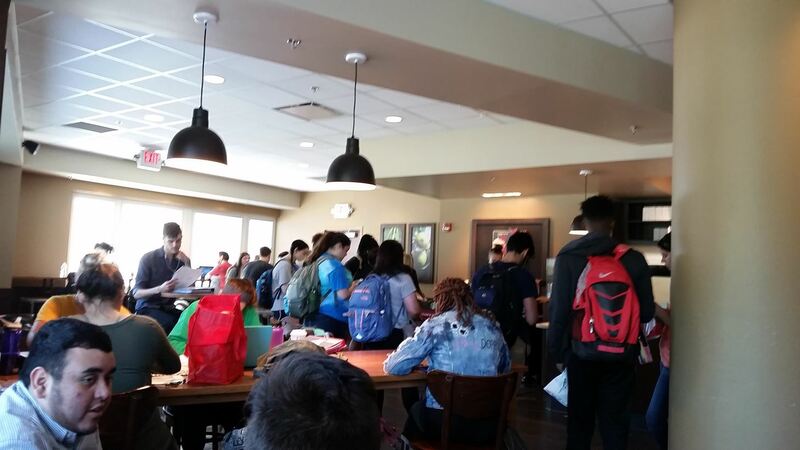 To test it out I set off to the local Starbucks, for reference you can see how crowed it was below. You can see there are quite a few devices in this small area. My setup was nothing but the internal Bluetooth and Ubertooth hardware. With an external Bluetooth dongle and the range it offers, I could have easily detected twice as many devices. 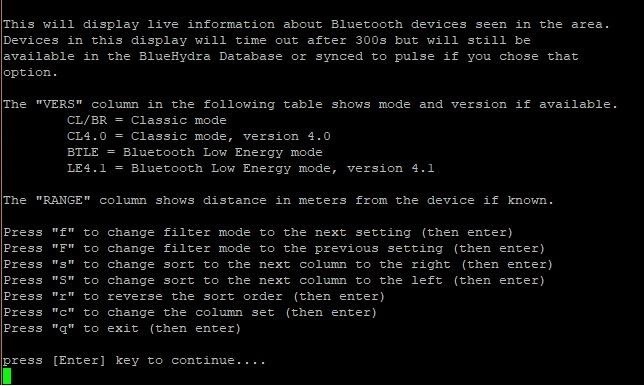 If you are wondering, I'm powering the Pi off of a battery pack and using Juice SSH on my smartphone, Blue Hydra is being run in demo mode to help protect the privacy of the people. log_level If this is set to "false" then the log files will not be created. bt_device This is how you change the main Bluetooth interface, change if you're using a dongle. info_scan_rate This is how often info scan is run in seconds. status_sync_rate This is how often to sync device status to Pulse in seconds. btmon_log When True it will log filtered btmon output. Blue Hydra saves to two log files, "blue_hydra.log" is where it logs all the data it collects, which is more than it shows on the user interface, this is how it tracks devices over time. 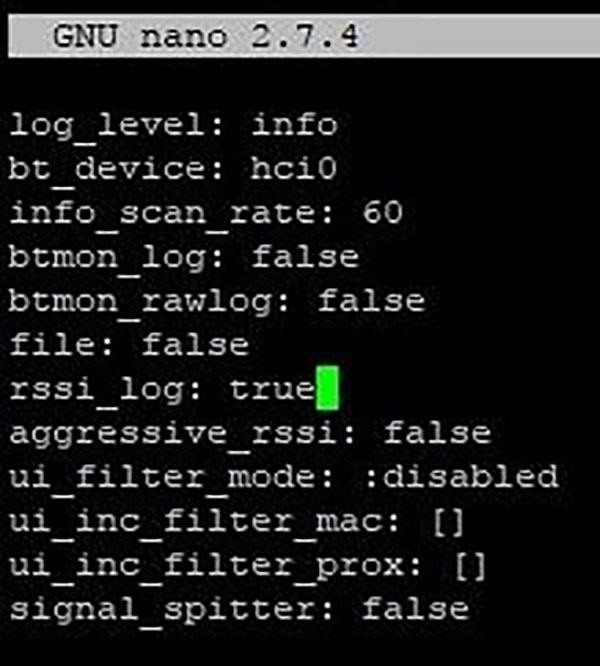 The second, "blue_hydra_rssi.log" is where it logs signal strength which can be used to find the distance to the Bluetooth device. For example, you could make a simple python script that alerts you when a certain device is close by, just as the Hacker Warehouse team did. Let's download it and take a look at it. Below this you can also set how often it reports, the default is 45 seconds. While you are here you may want to go over the code. The program checks the RSSI log for the MAC IDs from our list. When you're done, save just like before with Ctrl + X and Y then Enter. Now let's put it in action with cd blue_hydra/bin/ and then use sudo ./blue_hydra now open another shell and move to Blue Hydra with cd blue_hydra then run python ble_finder. If all is working properly you'll see something like this. Now that you have the basics, you can do something much more advanced. Say you wanted to get into a high-level executive's office, but you need to know when they are there. You could put a Pi running Blue Hydra, and set some code to email me when his Fitbit leaves the office. You could also set up a trilateration program to map all the devices in the environment. Even just leaving it sitting in place can yield interesting results. The real limiting factor to Blue Hydra's usefulness is your imagination, so don't let it hold you back! Neat setup! Can you write up how you were able to get Pi to connect to the local wifi and then to your phone? Or is it connecting directly to your phone? I really like the idea of the "coffee shop" setup hidden in a bag or pocket. Great question! You can Turn Your Raspberry Pi into a Wireless Hotspot and that would let you connect your phone directly to the Pi, by connecting it to the Pi's network. I didn't do that however, I was lazy and just wanted to demo it so I logged into the Pi on one of the nearby TVs using a HDMI cable and a Bluetooth keyboard. Then in the top right of the screen, there's an icon to connect to a Wi-Fi network. I connected both my phone and the Pi to that same network. Once you have your phone and Pi on the same network you can open a secure shell with an app such as JuiceSSH. I hope that makes sense if you have any more question just ask. And yes it would be very easy to have one in a bag or backpack and be monitoring it on your phone. I literally walked in with the Pi in my hand antennas and wires going everywhere and no one said a word to me or even seemed to notice. I could have easily plugged one into a hidden power outlet in some corner and had it there for days logging data and if I had set up port forwarding too I could even have monitored it from home. Hey its so cool. I had this college project which i suppose to scan the students presence by their bluetooth. I need the RSSI so the one who dont enter the class wouldnt be get attending mark. I was wondering what if i dont want to scan "continously" using blue hydra? Instead its only scan once and send the data as json to iot interface like ubidots or thingspeak. is it possible?